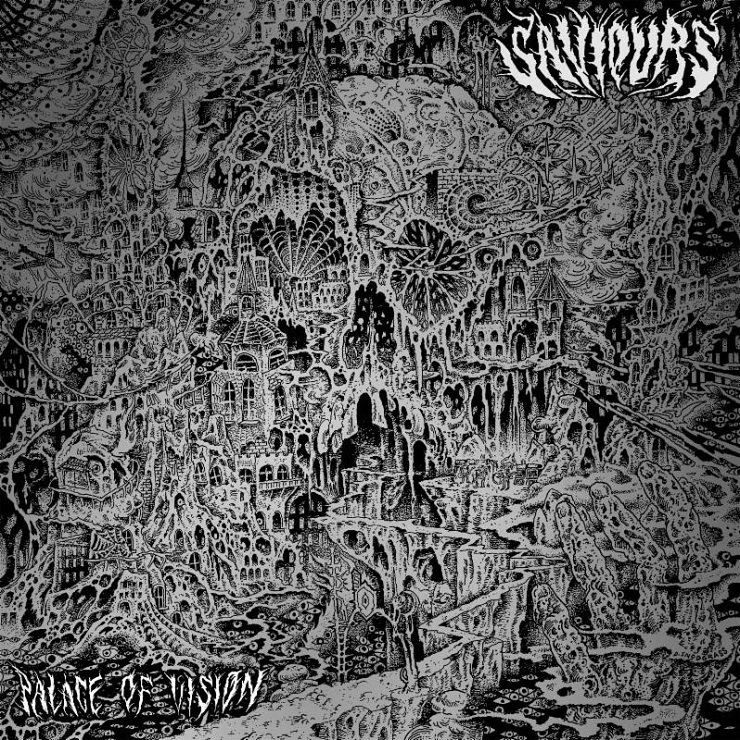 While Austin Barber has been putting a lot of legwork into his Obliterations project with Black Mountain's Stephen McBean, he's still grinding it out with his longtime metal outfit, Saviours. Those California crushers have just announced that their first full-length in four years, Palace of Vision, will be erected October 30 via new label home Listenable Records. A press release notes that the quartet have inked up with the French imprint to deliver the new LP, which follows 2011's Death's Procession. The nine-song set was tracked with producer Billy Anderson (Neurosis, Eyehategod) at Portland's Type Foundry facility, with drummer Scott Batiste revealing in a statement that "there are some doomy crushers and faster ragers." In addition to sounds that traverse the realms of progressive rock and proto-doom, the stoner-style ensemble's latest LP is also said to continue their "obsession with the end of times, the occult, psychedelics and the arcane." In particular, Batiste has said that newly premiered album track "Burning Shrine" is about "watching the world burn as it is ruined by religious zealots." You can sample the rip-roaring offering down below, via CVLT Nation, where you'll also find the full tracklisting for Palace of Vision and info on a pair of U.S. festival dates. The oculus architecture that illustrator Derrick Snodgrass (Obliterations, Lecherous Gaze) crafted for the Palace of Vision cover can be seen up above.